Why Be Curious? 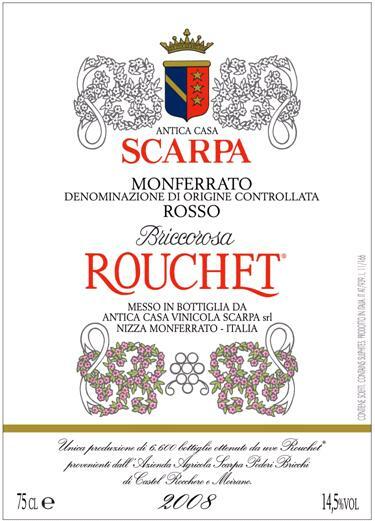 “Rouchet”, pronounced à la française without the t, is Scarpa’s name for their varietal Ruchè (because they’re outside the official Ruchè appellations and thus can’t use the regular name). As with all the other Scarpa wines, Ruchè gets the special treatment of extra age and extra elegance. Cantina / Cellar: Fermentation and aging for at least a year in stainless steel tanks, followed by a minimum of one year (and usually much longer) in bottle before release. Il Vino / The Wine: Ruchè as only Scarpa can do it, with bottle age and uncommon elegance. A Tavola… / At the Table… A classic vino da meditazione; especially good with Gorgonzola or Stilton. Also experiment with aromatic dishes. Vitigni / Varieties: 100% Ruchè. Età delle viti / Vine age: Planted around 1980. Élevage: In stainless steel, plus at least one year in bottle before release. Gradazione alcolica / Alcoholic %: 13-14%.